Unemployment seems to be budging very little, especially for blacks, where it hovers around 15.7 percent. Millions of so-called baby boomers are nearing retirement. More people, not fewer, are relying on Social Security benefits, especially African Americans. And as President Obama and Congress begin the process of hammering out a budget for 2012, with standoffs about what to compromise on and looking ahead to the next five to 10 years, guess what's on the chopping block one way or the other? Social Security. Neither Obama nor his Republican opposition will say this out loud as they focus on their favorite projects or the election of 2012. But black people need to focus on longer-term issues that are at stake in this budget battle. Think Social Security. The Joint Center for Political and Economic Studies warns African Americans to wake up and speak up, because their "dependence on the system is great." As the Joint Center notes in a report released this month, blacks rely heavily on those monthly Social Security checks. 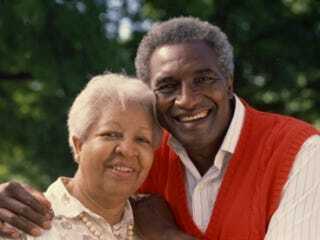 Indeed, in two of every five black households of retirees age 65 or older, Social Security is their only source of income. Another alarming statistic: One of every five black children relies on Social Security because of retirement, death or disability of the primary household breadwinner. Children constitute a larger proportion of black Social Security beneficiaries (11.8 percent) than white beneficiaries (4.3 percent), the report said. Established under President Franklin Delano Roosevelt, the system was designed to rely largely on taxes paid by workers and their employers to provide benefits to workers and their families who lose income because of retirement, death or disability. But now, declining birth rates mean fewer people are paying into the system; increasing retirement of baby boomers (people born between 1946 and 1964) means more people claiming benefits; and longer life expectancies mean that those beneficiaries will rely upon Social Security for longer periods of time. If nothing changes, even if current budget negotiations chip at the edges, there will be money for Social Security for at least 25 years, but the trimming can affect who qualifies for payouts and when. If, for example, the age for claiming benefits is raised to 70 or 75, a whole lot of blacks will lose out because they die sooner. Obviously, something's got to give to put the nation's federal and state financial houses in order. Battle lines have been drawn in Washington about fiscal policy, with little hint of bipartisan compromise. Even before it was officially released, Republicans were already condemning the president's proposed $3.7 trillion 2012 budget as nothing more than a plan for spending, taxing and borrowing, while doing little to address the national debt. The president and his defenders point out that, among other things, he is proposing deep cuts in domestic programs that the Republican House budget plan would wipe out. "It would mean cutting things that I care deeply about, but if we're going to walk the walk when it comes to fiscal discipline, these kinds of cuts will be necessary," the president said on Feb. 14, in unveiling a budget that was no valentine to either the right or the left. At the news conference a day later, he said, "I definitely feel folks' pain." The truth is that no one really wants to feel the pain, whether the issue is the big three entitlement programs — Medicaid, Medicare and, especially, Social Security — or delivery of municipal services. Just look at what's happening in the civil war under way in Wisconsin over public employee unions. In New York, as elsewhere, officials grappling with budget deficits have come up with a range of solutions, including layoffs and furloughs of government employees. In New York City, that included some of the folks in the sanitation department who would be clearing the roadways of snow and ice during this abominable winter. When the job wasn't done fast enough or to the liking of some squawkers, they blamed the city for a slower-than-usual response. But part of that was because of a reduced sanitation work force. There will be more of that. Teachers' unions are complaining about potential layoffs, but in light of federal cuts to states for education and state education cuts to cities, something's got to give. In his budget plan, President Obama proposed billions in cuts but did not tackle Social Security, which is now paying out more in benefits than it is taking in through payroll taxes. "First things first" is his attitude, as is that of Rep. Charles Rangel (D-N.Y.), the senior Democrat on the House Ways and Means Committee. He said in an interview that the 2012 budget is the priority and warned that to rashly link it to Social Security reform "would weigh the budget talks so far down that we would never be able to reach a compromise. In an already difficult situation, you'd just be throwing gasoline on a fire." During these fiscal battles, blacks need to make their voices heard — loudly — in the national debates about the budget and about Social Security. This can be like explaining why voting for a particular presidential candidate is about the future Supreme Court and how that could affect generations to come. Medicaid, Medicare and Social Security make up more than half of the federal budget. Fiscal conservatives, especially those dangling from those Tea Party strings, see a major overhaul of Social Security as an immediate goal; others agree with President Obama that more thought needs to go into how to fix the system. At a news conference, the president said, "This is not a matter of 'You go first' or 'I go first.' This is a matter of everybody having a serious conversation about where we want to go and then ultimately getting in that boat at the same time so it doesn't tip over. And I think that can happen." On Meet the Press a couple of weeks ago, House Speaker John Boehner (R-Ohio) said that most Americans do not understand the Social Security system and projections for its future. Rangel agrees. But Boehner said that Republicans will not unveil their ideas for reforming the current system until after there has been a period of educating the American people. Rangel told me that he, too, believes there needs to be an education campaign. Writing in the Washington Post, Paul Light, a professor at New York University's Wagner Graduate School of Public Service, has offered this suggestion for what he terms "shared sacrifice": "Younger Americans and small businesses would have to pay higher payroll taxes; older Americans would have to accept benefit cuts and bigger 'doughnut' holes; organized labor would have to swallow an increase in the retirement age; and wealthier Americans would have to pay taxes on a higher percentage of their benefits." That's a start. Now the Obama administration, Congress, the think tanks, economists and advocates for those for whom Social Security is a key component of the social safety net need to get serious — once that 2012 budget is passed and Social Security is no longer the issue not being discussed. E.R. Shipp is a frequent contributor to The Root.